If you are here for news of the "Don't Cook Your Dog Campaign" click here ... but, please read on before you go as we do have a very quick couple of competitions to enter before you move on to more serious matters... Can you guess which two breeds came together to produce this first cross? Part of one parent's name is made up of a suggestion you might make to a bowler in cricket. 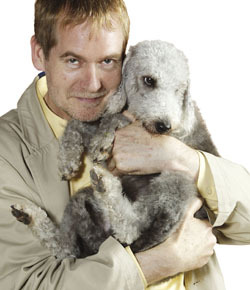 The other is also a gundog that is defined by a hairstyle popularly adopted by comedians wanting to depict scousers! 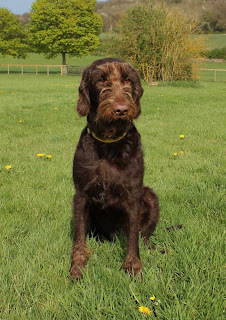 It's been won - the correct answer was an Italian Spinone crossed with a Curly Coated Retriever! But there's still time to enter the caption comp. Can you think of a good caption for this pic of the lovely Woodstock? Best one wins a Nina Ottosson Pyramid and five runners up win Coachies treats. Email comps@dogstodaymagazine.co.uk or post your best efforts on our Dogs Today facebook page thread. We'll judge it tomorrow at lunchtime, so hurry up and enter! "ready or not, jasper...here I come! "I don't think anyone will find me here"
I think mummy has gone too far this time with her downsizing lark! who washed my house on the hot wash? !